I’m new enough to Los Angeles that I still think it is cool that I live so close to where the Academy Awards take place. Not particularly because of the celebrities but because I love film. I’m also a sucker for ‘world events’ and the Oscars certainly qualifies. Last year, I stumbled into finding out that you can get pretty close to the Oscar’s Red Carpet preparations. At one point, I was actually standing on the red carpet and I would be lying if I said I didn’t think that was pretty cool. I ended up getting some great photos of the Oscars Red Carpet preparation. Chris is in town this weekend (yay!) and I thought it would be neat to take him down to see the red carpet setup. What I didn’t know when we made those plans was that Los Angeles was about to have a massive rain storm. Those that don’t live in Los Angeles often make fun of the way the city reacts to rain. In most cases, that is completely valid. This time though, this storm was the sort that pose a challenge to most cities. Busy streets were flooded as the rain came down hard and fast. Nothing in Los Angeles was able to escape the storm and that includes the Academy Awards. As we got close to the Hollywood and Highland Center,where the Oscars are held, it was clear that we weren’t going to be able to get as close to the red carpet this year. Mostly because, they had put a big tent over it. A shame because I had been crossing my fingers that we would get to see a red carpet full of dripping wet actresses in expensive gowns. As you can see, the rain was making the Academy Awards setup difficult. 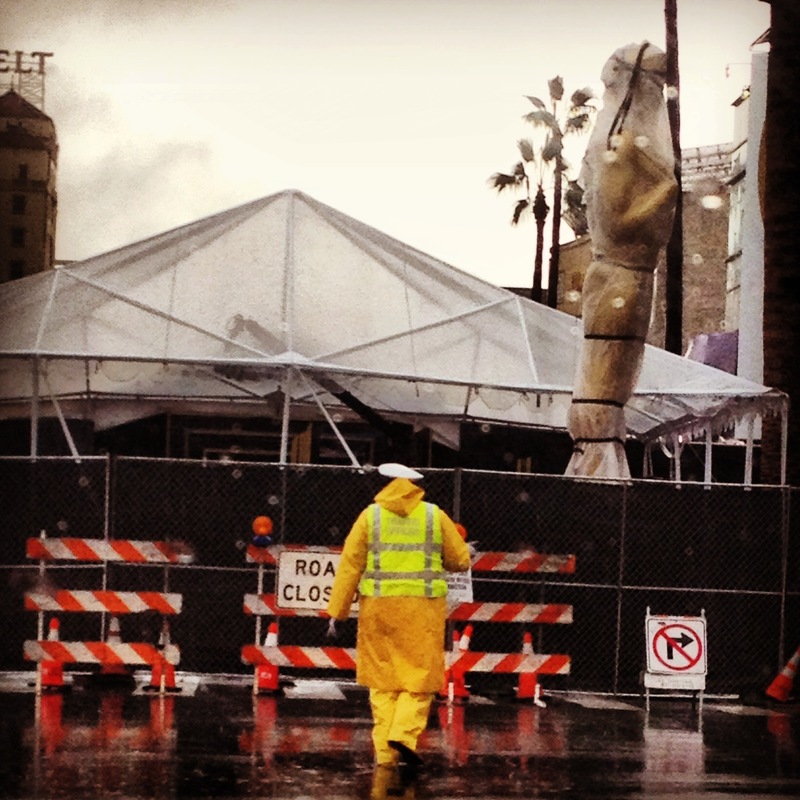 They even had to have the giant Oscar statues covered in plastic to keep them safe from the rain. Inside the Hollywood & Highland Center, the other preparations for the Oscars ceremony were well under way. 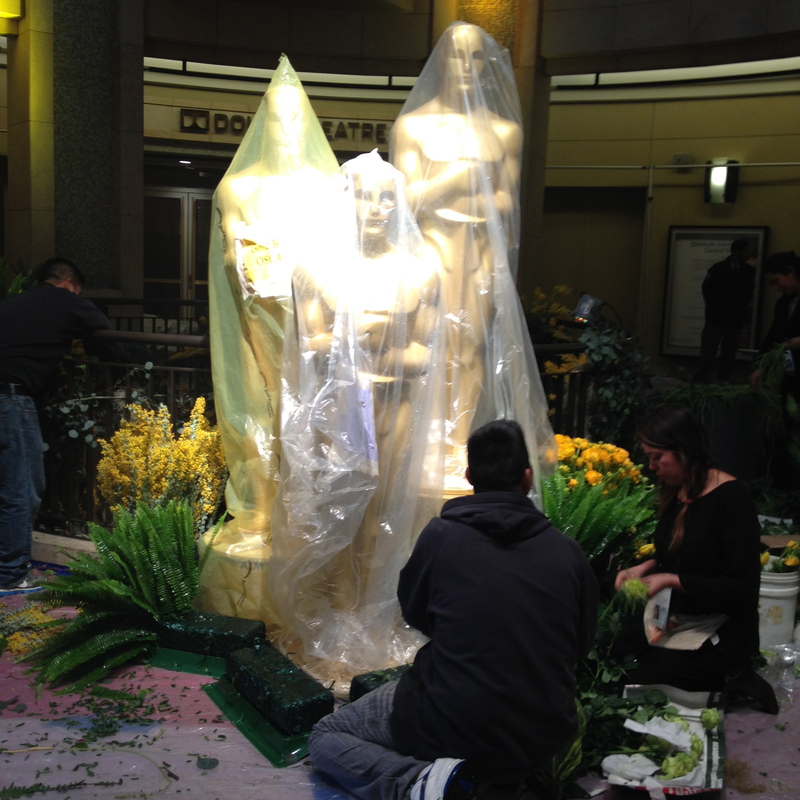 The hallways were filled with the scent of freshly cut flowers that were being placed around smaller replicas of the Oscar statue. Before we left, we did get to get a look at the rolling out of the red carpet. 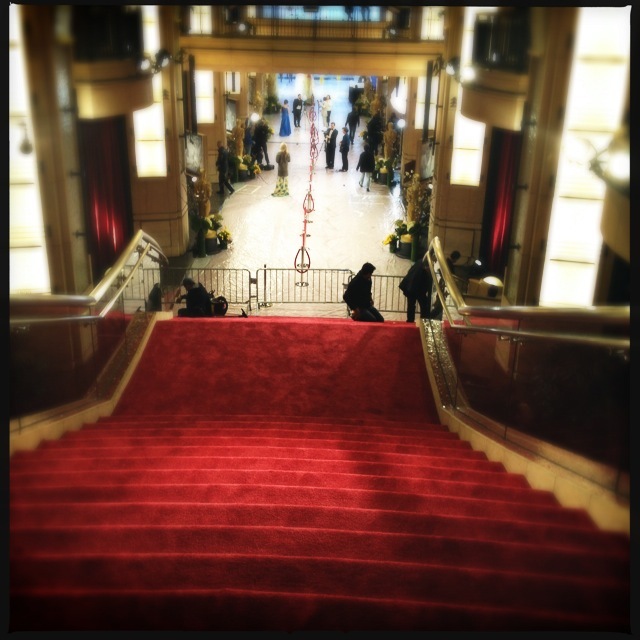 At least, the portion of the Oscars Red Carpet that is inside the building. I’ve been down these stairs fairly often since the building is a busy shopping center the other 364 days of the year. Never, in any of those times, did they look as snazzy. This entry was posted in Street Photography and tagged Academy Awards, Hollywood. Bookmark the permalink.